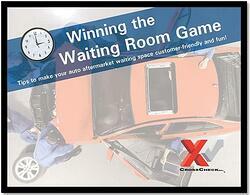 Auto Aftermarket: You CAN Win the Waiting Room Game! Your auto aftermarket waiting space can be a place where customers sit and watch the clock, or a sanctuary they actually enjoy as they wait for parts and service. When and why to send your customers out of the waiting room!